Fruit ‘breathes’: it uses oxygen (O2) and produces carbon dioxide (CO2). A CO2 adsorber removes the carbon dioxide (also referred to as carbonic acid) that forms from your storage cells in order to prevent concentrations getting too high and causing damage to your fruit. preferred storage conditions for CO2 in the cell. 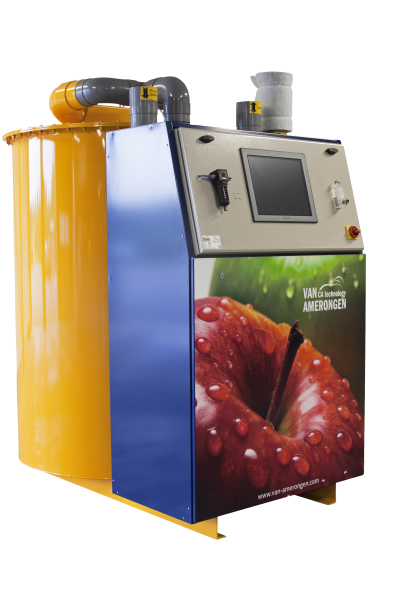 Van Amerongen supplies a broad range of CO2-scrubbers with capacities of 50 to 900 kg per 24 hour period (at 3% CO2). A unique system of sieve and distribution plates enable our CO2 adsorbers to be up to 30% more efficient. The VA lung (buffer) system ensures there is minimal addition of O2 during the removal of CO2.